A San Francisco animal shelter is under fire for using a security robot, dubbed K9, to push out homeless people encamped nearby. America’s disruption capital, San Francisco, has both a crippling housing crisis and an abundance of startups using automated robots for everything from delivering sandwiches to deterring crime. The K9 in question is actually a K5 unit from Knightscope, a Mountain View security company. 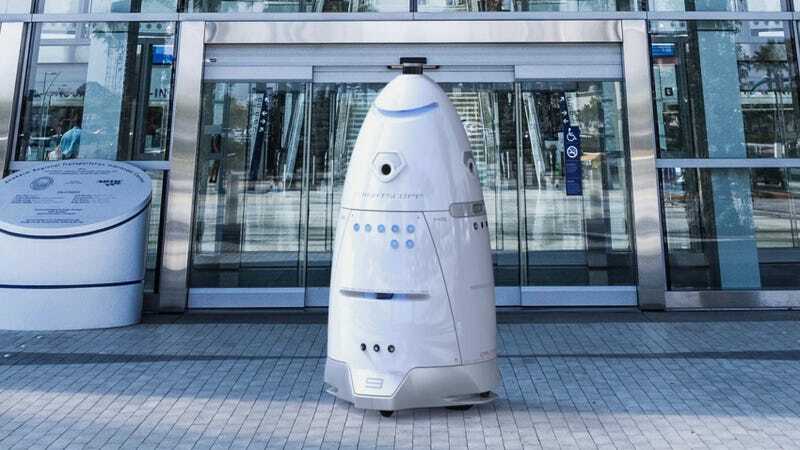 The K5 is probably best known as the security robot that committed seppuku by drowning itself in a fountain and running over a toddler. As part of a wider robot crackdown, San Francisco has already threatened to fine the shelter for operating the robot on sidewalks without a permit. In early December, supervisor Norman Yee proposed an outright ban on robots—mostly linked to food delivery apps—but settled on permits. The city will issue a total of nine permits to companies using delivery bots, with each permit allowing up to three bots. The SPCA doesn’t have one. Jennifer Scarlett, the city’s SPCA president, told the San Francisco Business Times that, while delivery and security robots can be a nuisance, their K5 wasn’t the problem. The homeless encampment was. “We weren’t able to use the sidewalks at all when there’s needles and tents and bikes, so from a walking standpoint I find the robot much easier to navigate than an encampment,” Scarlett said. Businesses think they can save money by supplanting human workers with automated robots, but in doing so they’re reducing employment and exacerbating the problem of homelessness. Homelessness is a crisis of resources, but it’s treated like a crime—encampments are illegal, crackdowns are frequent, and housing shelters are overburdened. Thus, a security technology meant to deter criminals is being hailed for deterring the homeless. The problem has less to do with the specific technology itself (though Knightcorp’s immense surveillance capabilities are troubling) and more to do with the social consequences of its application, something that should always be considered with public-facing tech. So why wasn’t it?